My first view from an Adirondack summit was at the tower on Goodnow Mountain near Newcomb, and I can still recall the thrill. I was 11 or 12, and some friends and I were staying at a summer camp on Long Lake. The tower, maintained by the state College of Environmental Science and Forestry, offers a spectacular view of the High Peaks from the south. These days, hikers will find pamphlets at the parking lot that can be referred to at numbered stops along the trail to learn about the mountain’s natural history. We happy campers did a lot more hiking that summer, including a trip up Vanderwhacker Mountain, another peak with a fire tower. We climbed several of the High Peaks—such as Marcy, Skylight and Colden— and took canoe trips on the Old Forgeto- Saranac Lake route. But I’ll never forget that fire tower on Goodnow, and I suspect it’s the same for lots of first-time visitors to the Adirondacks, especially children. While the sense of accomplishment and view gained by ascending any mountain are their own rewards, there’s something special about a fire tower on the summit. But people who live near or climb peaks with fire towers often grow attached to the historical structures. In the Adirondacks, a number of volunteer groups have cropped up to restore and maintain their favorite towers. Freeman says vandals’ destruction in 1992 of the tower on Pharaoh Mountain— a “non-conforming” structure in a tract classified as Wilderness—galvanized people to save other towers. In addition, some towers have earned a new lease on life as mounts for cell-phone and other communications equipment. A retired research chemist who now works for the Adirondack Mountain Club, Freeman is a proponent of fire-tower restoration where appropriate. 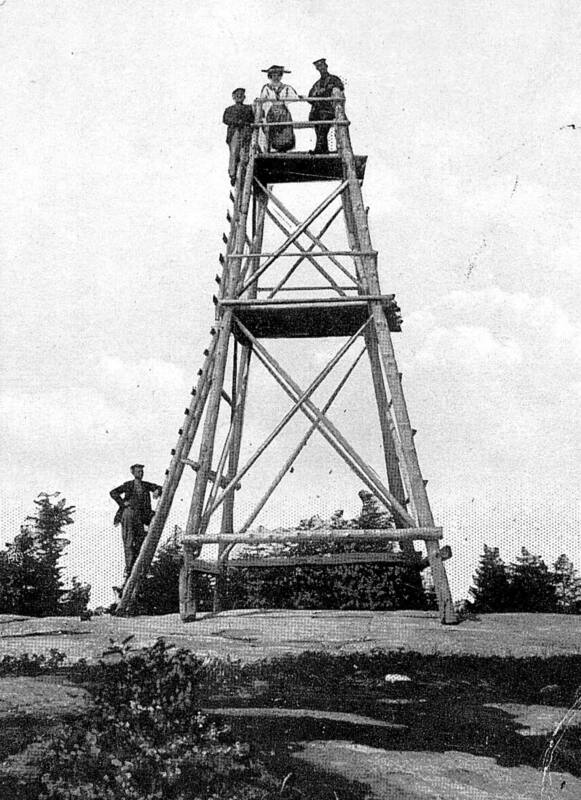 Views from on High—written with Wesley H. Haynes, a historic preservationist—contains a succinct history of the state’s towers, starting with the observation platforms built by Verplanck Colvin in his landmark survey of the Adirondacks in the late 1800s. Raging wildfires in the early 1900s goaded the state into building scores of towers in the Adirondacks and Catskills. About two dozen towers remain in the Adirondacks, and although the state intends to tear down some of them, Freeman believes most have a bright future. 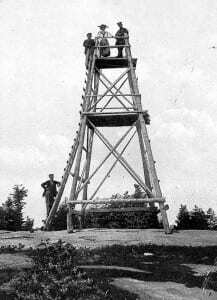 A wooden tower stood atop Blue Mountain in the early 1900s. At the heart of the book are descriptions of hikes to 28 fire-tower summits—23 in the Adirondacks and five in the Catskills. Each includes a map, trailhead directions, difficulty rating and details about the route. It also tells you which towers are safe to climb. In conjunction with the book, the Adirondack Mountain Club has begun a Fire Tower Challenge: Anyone who visits all five of the Catskill towers and 18 of the Adirondack towers will earn a patch. You don’t have to be a club member to participate. Forms for the patch can be found toward the back of the book and at <www.adk.org>, the club’s Web site. 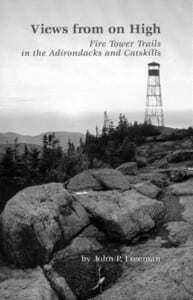 Whether or not you take up the Fire Tower Challenge, I recommend you try some of the hikes in this book. You might start off by visiting the newly refurbished towers, such as the one on Snowy Mountain, the Adirondacks’ highest summit outside the High Peaks, or Poke-O-Moonshine, with its view of Lake Champlain, the Green Mountains and Whiteface, or Hadley Mountain overlooking Great Sacandaga Lake. The towers on Blue Mountain and Bald Mountain also offer exceptional views. The High Peaks vista from Vanderwhacker’s tower is justly celebrated. And that’s only a start. But if you want to see the towers on Hurricane and St. Regis mountains, you better do so soon: The state plans to dismantle them this year. Both are located in areas of the state Forest Preserve where such man-made structures are considered inappropriate. However, it looks like most of the other towers in Freeman’s book are here to stay—including my favorite on Goodnow.